A great looking Ulysse Nardin watch that is also downright practical, today we’re highlighting the Executive Dual Time. Launched in the late-2000s and still a part of the current collection, the Ulysse Nardin Executive Dual Time brings together steel, ceramic, and leather to great effect. 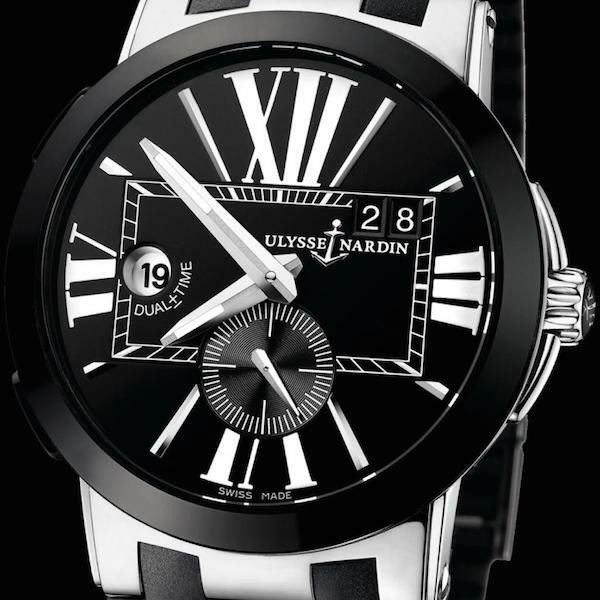 Let’s find out more about this dressier yet super sharp Ulysse Nardin timepiece. While Ulysse Nardin offers this model in several different metals and colorways, what we have here is the steel version; the Executive Dual Time ref. 243-00/42. The watch sports a 43 mm stainless steel case topped with a black highly polished ceramic bezel that’s ultra-resistant to scratching. Plus, the two pushers–located on the left-hand side of the case–are also in black ceramic. In true Ulysse Nardin fashion, in between the pushers is a plaque with the watch’s unique serial number. On the right-hand side of the case is the winding crown, thoughtfully decorated with black enamel and the Ulysse Nardin anchor logo. Note the unique steel lugs designs of this Ulysse Nardin watch, which has a shape that mimics the letter E. Whether that was done deliberately to honor the Executive name or merely a coincidence, we don’t know. But what we do know is that they curve around the wrist comfortably and we love the interlocking look of the steel lugs and leather bracelet. 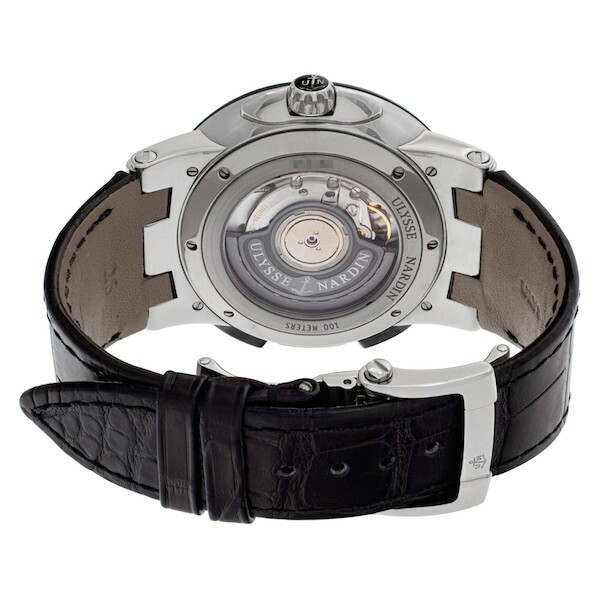 The leather bracelet is also black to match the rest of the watch and comes fitted with a steel deployant clasp. Although the case, bracelet, and strap are all superb, it is the dynamic dial of the Ulysse Nardin Executive Dual Time that sets this watch apart. 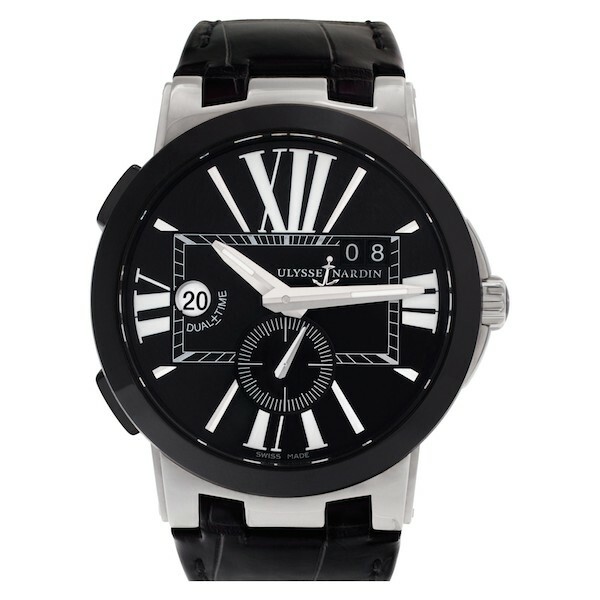 At the center of the metallic black dial a horizontal rectangle with a railroad style minute track. Inside that rectangle sits the big date in a double window, along with home time in a small round aperture. The dial is also home to four oversized stylized Roman numerals, sitting alongside faceted and tapered baton indices. At six o’clock is a running seconds subsidiary dial to accompany the large and luminous hour and minute hands at center. Thanks to its dial design and choice of colors and materials, this is a Ulysse Nardin watch that makes a statement on the wrist. Powering the Ulysse Nardin Executive Dual Time is the Caliber UN-24, which offers a unique time zone quick setting and permanent home time display. The pushers on the case serve to “jump” the hour hand forward (via the top pusher) or backward (via the bottom pusher) in one-hour increments. So if you travel to another time zone, you can keep your home time hour in the small round window as a reference and move the hour hand forward or backward accordingly to whatever time it is in your new destination by pressing on the pushers. The automatic Caliber UN-24 provides a 42-hour power reserve and the movement can be seen through the transparent sapphire caseback. 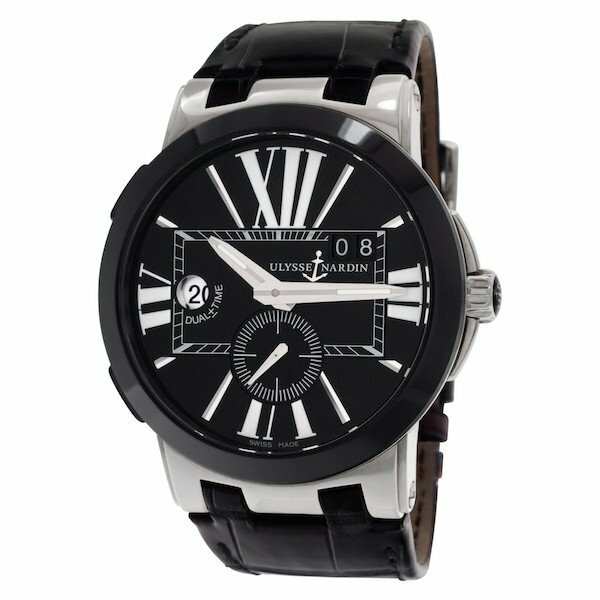 The Ulysse Nardin Executive Dual Time is water resistant to 100 meters (330 feet). Sleek, user-friendly, and expertly engineered, the Ulysse Nardin Executive Dual Time is a fantastic watch for those who frequently travel across time zones. And even for those who do not, it’s a handsome luxury watch that is proudly different in style from so many other top-notch timepieces.